While the main event of our trip to Chengdu was visiting the Chengdu Research Base of Giant Panda Breeding, there was plenty of other fun to be had during our three-day trip. 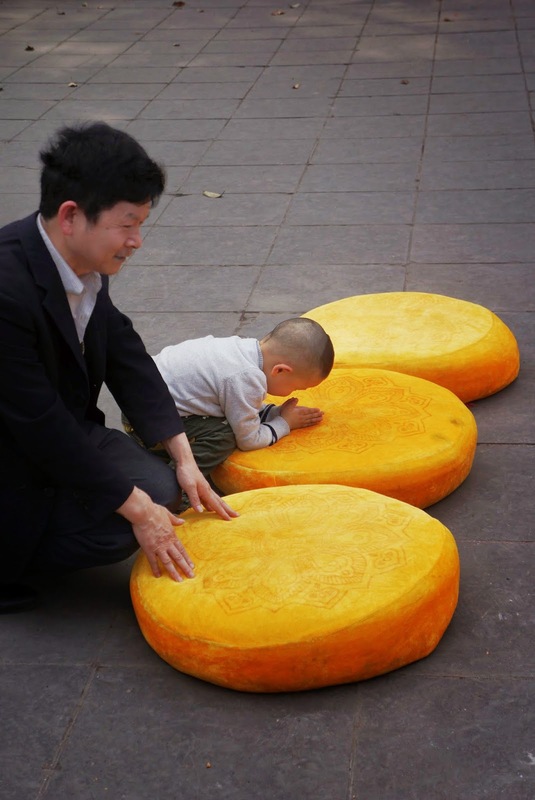 Here are some great ways to explore all Chengdu has to offer without the panda-monium. 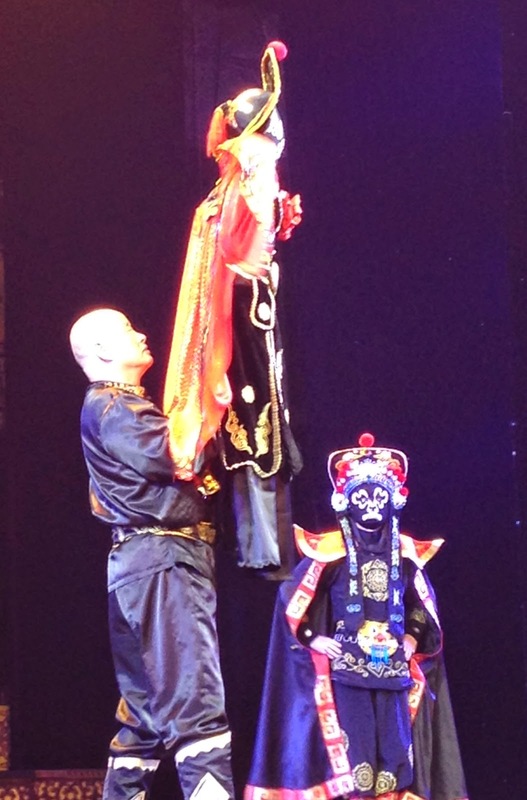 Sichuan Opera was definitely a memorable experience. For 80 minutes the audience was entertained by acrobats, puppets, fire breathers, mask dancers, fire breathing mask changing puppets, and more. 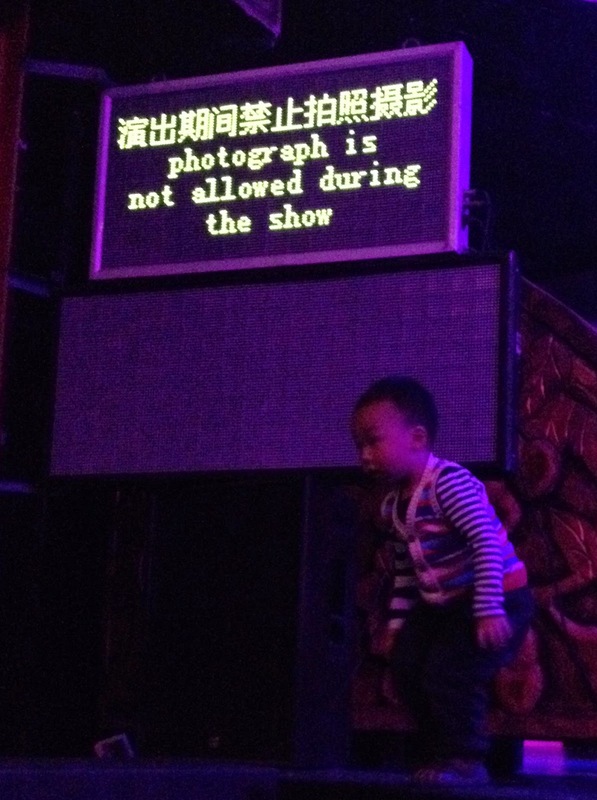 Unfortunately there was a strictly enforced no photography rule at the Opera. If people tried to sneak shots with their cameras or cell phones, ushers would interfere with high powered laser pointers. Fortunately, I was able to sneak a few pics. The performers wore fascinating masks that would spontaneously change colors. Legend has it that the good performers used pins to change different colored layers. Some actors used battery operated masks. 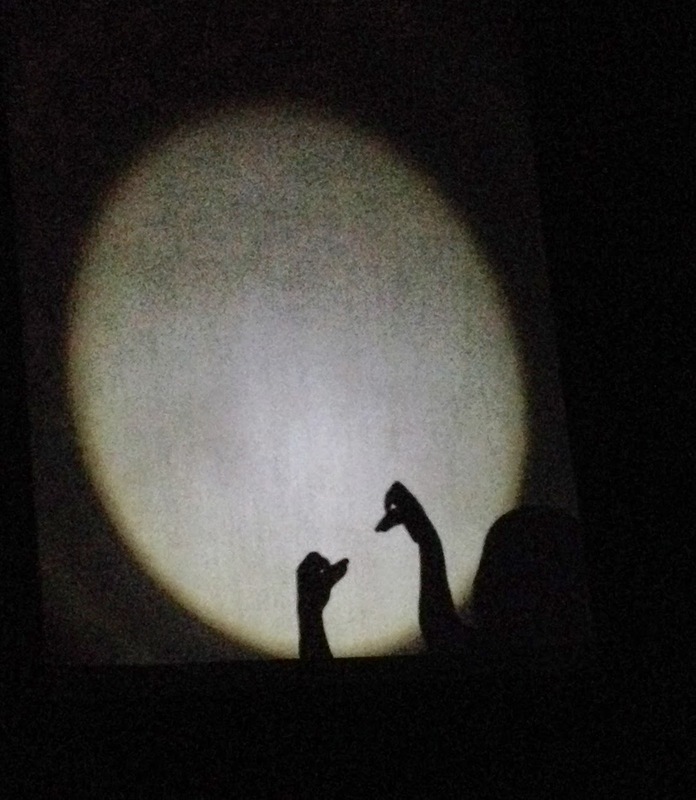 For one act, we were entertained by hand puppets. Many of the puppets were quite beautiful. 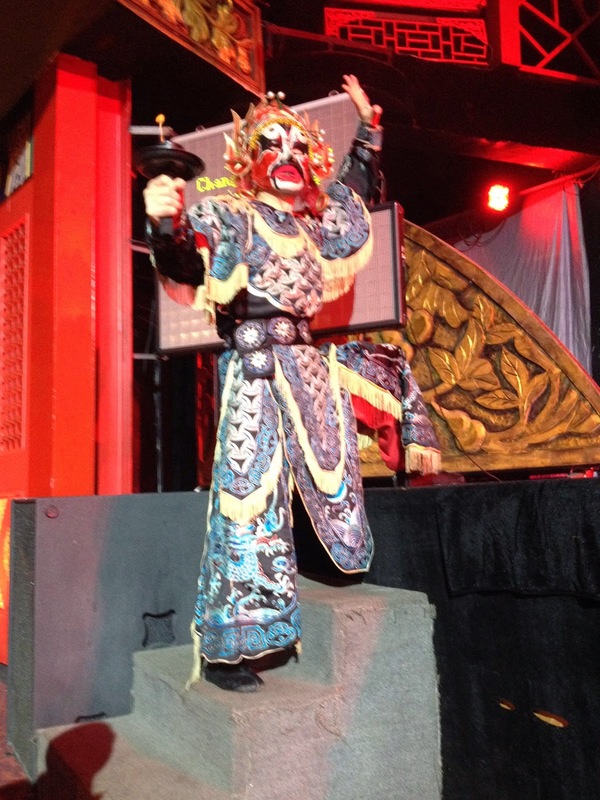 I was extremely impressed with the fire breathing mask changing puppets. 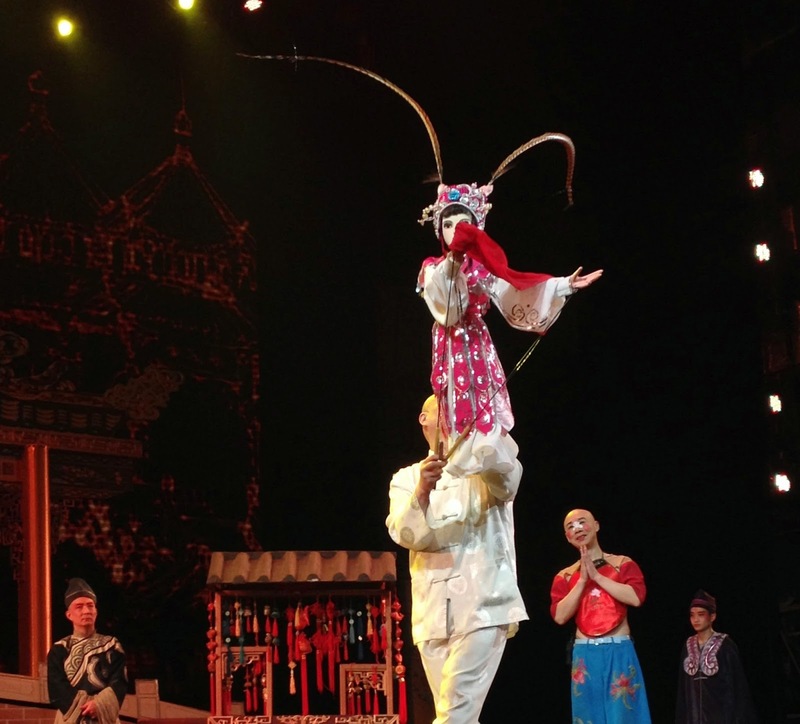 Accompanied by a soundtrack that resembled clanging pots and pans and the odor of gasoline, Sichuan Opera is an experience that should not be missed. 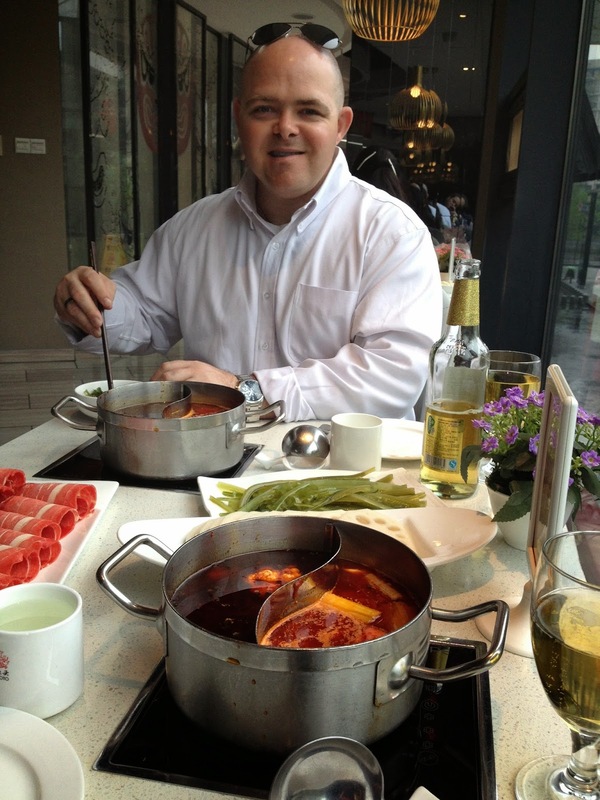 Hot pot is a dining concept similar to fondue. I have to confess I’m not a spicy food person AT ALL! However, the spicy hot pot at Tanyoto Hot Pot restaurant was amazing. I appreciated how I was able to have my own pot of bubbly soup! The soup was full of spice! The key to surviving this amount of heat is to include vinegar in your dipping sauce. The waitresses must have thought Chris and I were hot pot newbies. They kept approaching us after every 3rd or 4th bite to see if we were melting due to spiciness. It was hilarious! One of the best parts of exploring cultural streets you never know what you will encounter. 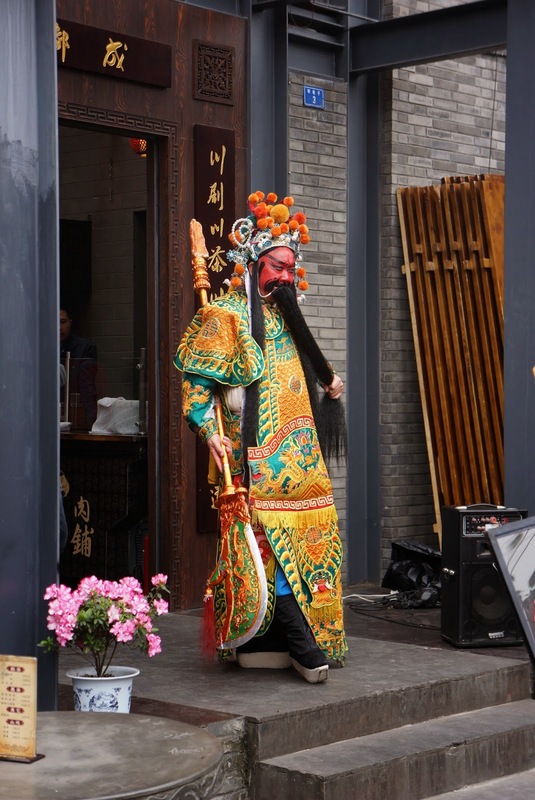 Sichuan Opera Characters were ready to pose with visitors. Feeling an excess of wax in your ears? 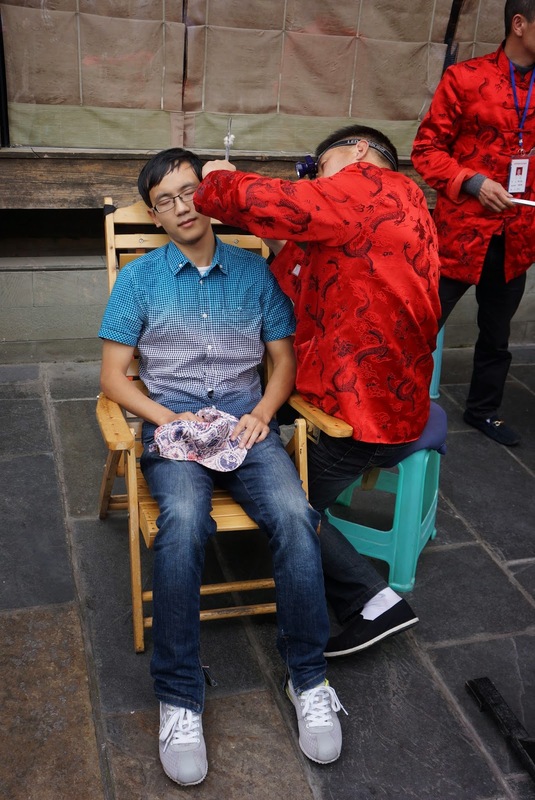 Have a rest and get your ears cleaned. 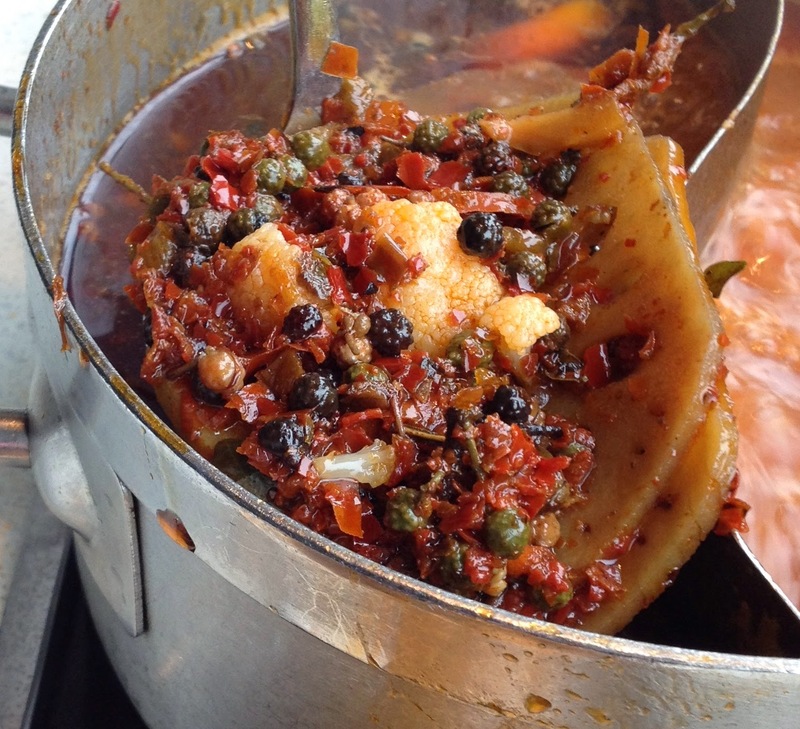 Street food is a must when wandering culture streets. 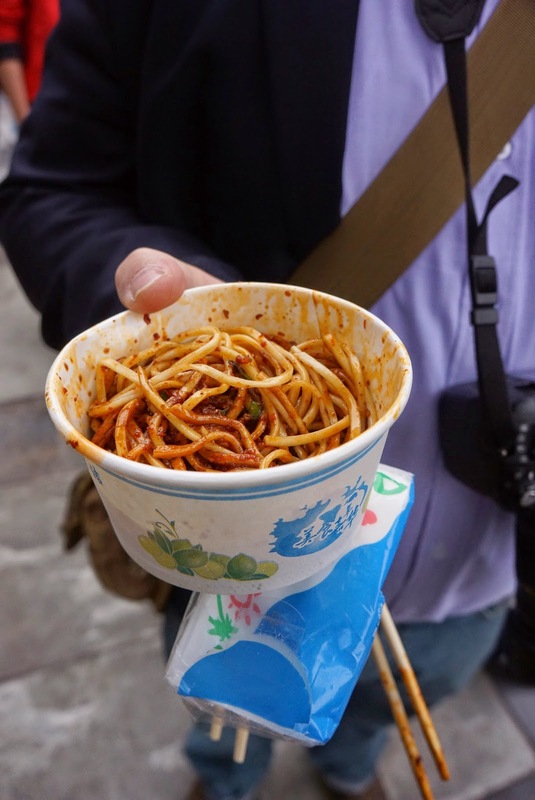 Chris said that this bowl of cold, spicy noodles was his favorite meal of the trip. 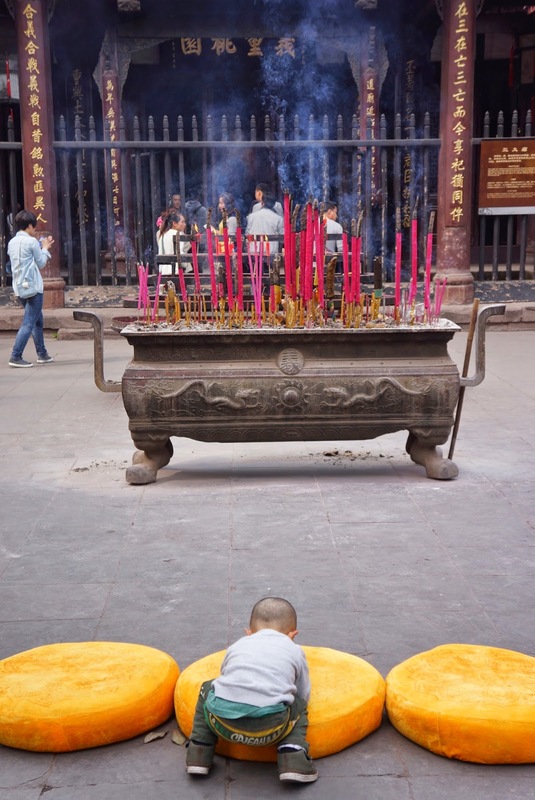 Worshipers of all sizes offered prayers at the Temple of Marquis Wu. This man offers large, green incense sticks in hopes of eternal youth. Our hotel was located next to Lan Kwai Fong and across from the Jing Jang River, so we spent a misty Saturday afternoon snapping pictures and enjoying the area. 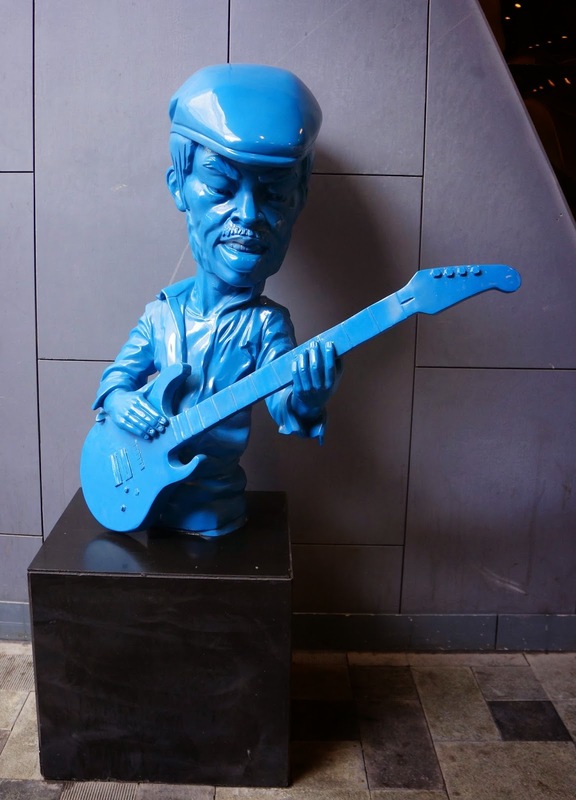 Lan Kwai Fong housed all kinds of Western inspired statues. Chris rubs the statue's head for good luck! I was surprised to find this structure was dedicated in 2013. The contrast of the old and new architecture was breath taking. Chris and I had to kill an hour before we headed to the airport, so we took a quick walk through People’s Park. In the center of the park is a large carp pond where visitors may feed fish with baby bottles. 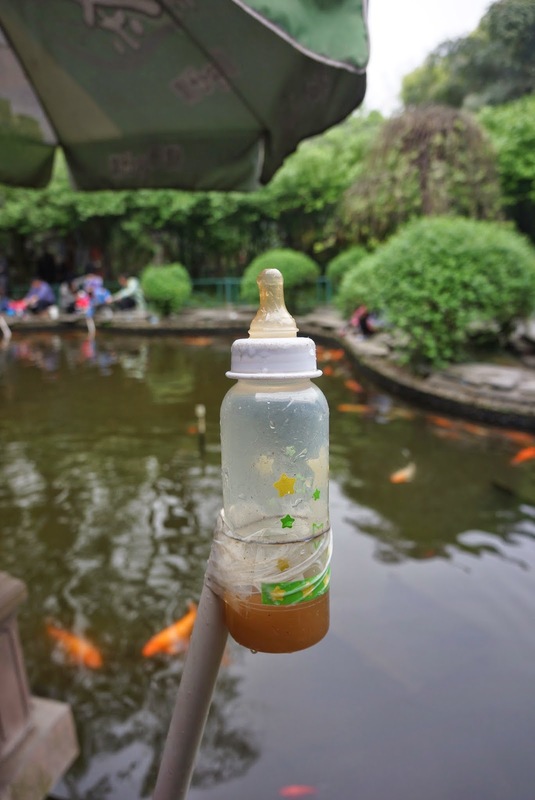 For 8 RMB (about $1.25), you can feed carp with a baby bottle attached to a stick. The carp loved sucking food pellets out of the baby bottle. Chris and I would have loved to see the Giant Buddha at Leshan, but unfortunately we ran out of time. 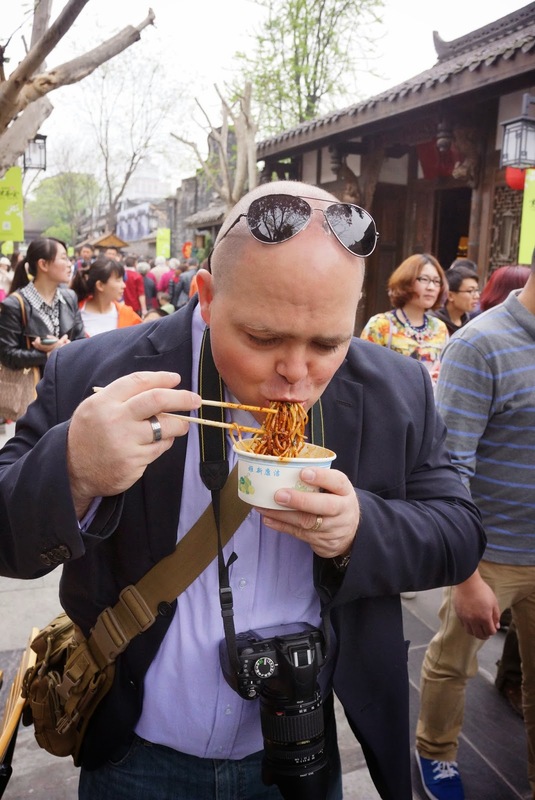 We had a great time, but after three days of fun, it was time to return to the daily hustle and bustle of Shanghai. 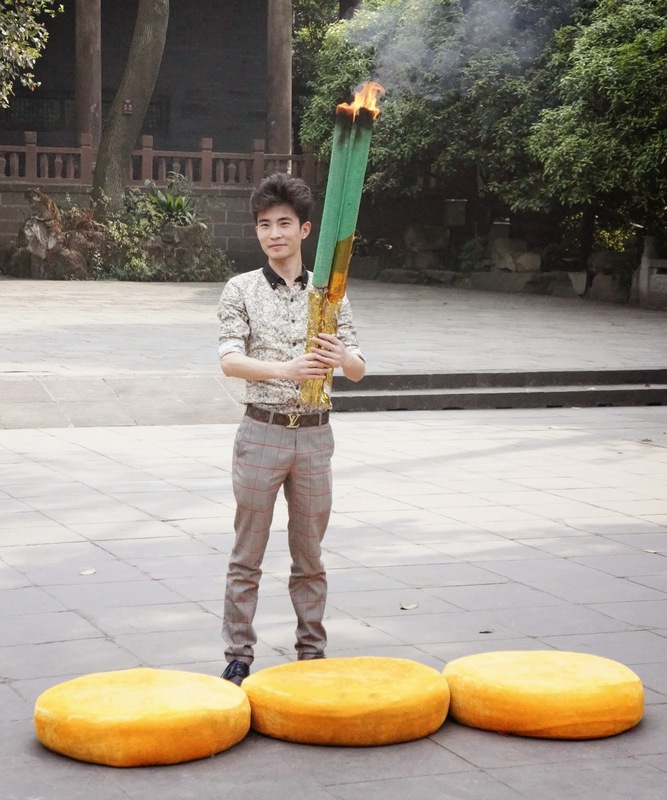 Exploring Chengdu was a great way to celebrate Qingming!